The Discovery Awards are all about celebrating – and connecting with – outstanding innovators whose game-changing achievements have helped to make Nova Scotia a leader on the world stage. As the marquee fundraiser, all proceeds directly support the Discovery Centre’s not-for-profit mission, enabling us to provide the very best in hands-on STEAM learning (Science, Technology, Engineering, Arts & Math) for youth from one end of the province to the other. In 2017, the Centre for Addiction and Mental Health (CAMH) launched a national dialogue on mental health. The initiative started with a call from CAMH and a National Committee of leading experts and advocates for Canadians to nominate those making a difference in the mental health space, in any capacity, local or national. By the July 1st deadline over 3,700 names were put forward making it clear Canadians care deeply about mental health and addiction. The purpose of the Governor General’s Innovation Awards is to inspire Canadians to embrace innovation and to emulate innovative, entrepreneurial risk-takers who have developed new or better ways of creating value and who are having a meaningful impact on our quality of life. As innovation and an entrepreneurial spirit are fundamentally important to all Canadians and can have a transformative, positive impact—regardless of whether it is in the private, public or not-for-profit realms—the awards encompass all sectors of Canadian society. HealthCareCAN recognizes and values the long term impact that health leaders have in shaping the health system. 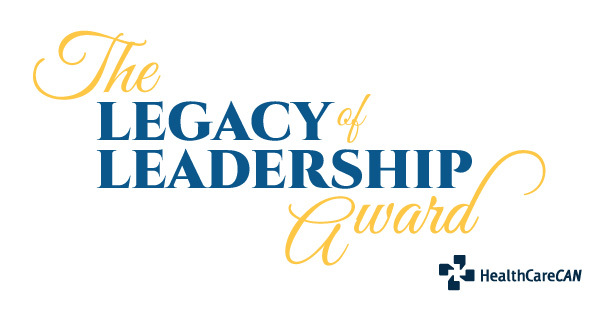 The Legacy of Leadership Award recognizes exceptional individuals who have made long-lasting and outstanding contributions to advancing Canada’s health system and have demonstrated significant and sustained commitment toward the enhancement of the health of Canadians. The prestigious Legacy of Leadership Award will be announced and presented each year in plenary at the National Health Leadership Conference.